For a decade, Michigan's economic dashboard has flashed red: high unemployment, record foreclosures, bankrupt automakers, population declines. And the Kalamazoo region hasn't been spared from the pain that spread across Michigan. But leaders and families in Kalamazoo are hopeful that the start of the 21st century will mostly be remembered for the birth, in 2005, of the Kalamazoo Promise, a nationally watched and admired initiative that pays tuition costs for qualified Kalamazoo Public Schools graduates attending Michigan colleges and universities. The goal is to not just transform the schools, but transform the area economy. And in the six years since the announcement of the Promise, the Kalamazoo region has outpaced the rest of the state on a wide range of economic metrics. Wage and salary employment, while declining slightly, was the best of 14 Metropolitan Statistical Areas between 2005 and 2009. Housing values fell less than just about everywhere else in the state from 2005-2010. The population in the city of Kalamazoo actually grew a little -- a rare feat for any of Michigan's larger cities. "I think it certainly has helped Kalamazoo weather this national depression much better than everyone else," said Bob Jorth, executive administrator of the Promise. "It reinforces the foundation that we have in Kalamazoo that education is what is going to keep Kalamazoo going." Researchers are quick to caution that the effect of the Kalamazoo Promise on the economy is hard to assess, for a variety of reasons. Capturing the right data is tricky because Promise scholarships only go to graduates in the Kalamazoo School District, which covers more than the city, but less than the county. Some of the modest influx of families into the city comes at the expense of other communities in the region. And the Promise was launched just before the bottom fell out of an already weak economy. In many cases, progress is measured by fewer steps backward. "I've spent a lot of time looking at that issue. It's very, very tough," said Michelle Miller-Adams, a visiting scholar at the W.E. Upjohn Institute who is studying the impact of the Kalamazoo Promise. "I don't think it's fair to say there is a direct causal relationship between the Kalamazoo Promise and the better performance of the Kalamazoo region (compared to other parts of the state). "That being said, we know that the Kalamazoo Promise has had a positive effect on a lot of different aspects of the community and has also solidified the region's commitment to education as part of its economic development strategy." While the precise economic impact of the Promise is still unclear, there's no question that the Kalamazoo area economy has fared better than the state as a whole since the November 2005 announcement that a group of anonymous donors were committing to pay the college costs for every Kalamazoo Public School graduate who attended district schools from kindergarten on. 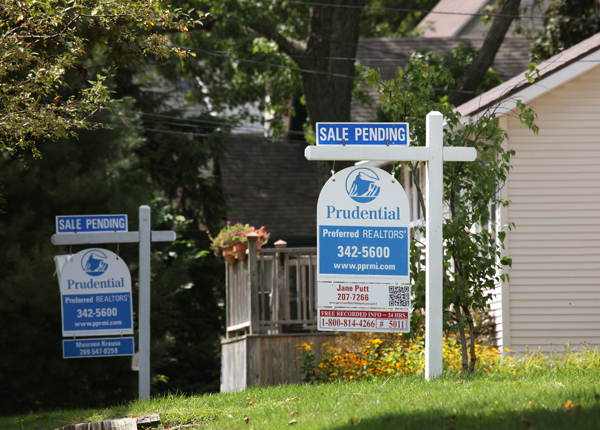 The 15 percent drop in housing prices was the second lowest among 15 areas, according to a review of information on the Michigan Association of Realtors' website. (Traverse City's drop was 14 percent.) In 2005, the average selling price of Kalamazoo area homes was $5,000 less than those in the Grand Rapids area, but five years later was $17,000 higher, the website data show. The Kalamazoo region's gross domestic product grew by 13.6 percent from 2005-2010, trailing only Niles-Benton Harbor and Lansing-East Lansing. The city's population decreased by 5.2 percent between 2000 and 2005, but grew 1.5 percent from 2005 to 2010, after the Kalamazoo Promise was announced. The first new subdivision in decades in the city was developed in that time span. "These are all consistent with the notion that the Kalamazoo Promise has been a plus," said Michigan State University economist Charles Ballard. "It's hard to know how much of a plus, but it certainly seems like according to many indicators, Kalamazoo has done somewhat better than much of the rest of the state." Craig Thiel, state director of the nonprofit Citizens Research Council of Michigan, says economic data indicate the Promise is "a piece of the puzzle, but by no stretch a silver bullet." Lou Glazer, CEO of Michigan Future Inc., believes the reason Kalamazoo has done marginally better than the rest of the state is primarily that it is less dependent on the auto industry, which was pummeled in the second half of the decade.
" I think the Promise is a spectacular experiment, and I am really glad it is going on," Glazer said. "I just have not seen any data yet that it has had the community development impact on the city that people hope for, or that it has substantially increased the chances that low-income kids in the Kalamazoo schools are more likely to get college degrees. If they both turn out to be true, that would be spectacular. I don't think we can say the answer to either of those is yes." What is indisputable is the national buzz the Promise sparked about Kalamazoo. Local leaders have aggressively incorporated it into their economic development strategy. In 2010, President Obama praised it during a speech to Kalamazoo Central's graduating class. This year, the Daily Beast, an online news site affiliated with Newsweek, listed Kalamazoo as one of the top 25 cities for college graduates, based on housing, employability, affordability and relationships. MSN's real estate website listed the Kalamazoo-Portage area as the third best place for "people seeking new starts," based on job prospects and affordable mortgage payments. "We had a German company in yesterday, and the first question they asked was, 'Can you tell us about Kalamazoo Promise.' The business community is keenly aware of it," said Ron Kitchens, CEO of Southwest Michigan First, the region's economic development agency. He said employers want to know not only that there is a talented work force today, but that there will be one in 50 years. Kalamazoo has long prided itself on itself on the number of PhDs in the community, but paid less attention to high school graduation and college attendance rates, said Kitchens. The Promise has put those measurements under the microscope as never before. "We are really changing the social fabric as well as the economics. Education is a long-term strategy," Kitchens said. "Anyone who believes that the promise or programs like it will bring a short-term boom to the community doesn't really get what we are going after." Kitchens said the Promise has another impact that benefits the community: The longer talented workers stay in Kalamazoo with their children in the public schools, the more economic incentive they have to stay because they don't want to walk away from full-tuition scholarships for their kids, which can be worth tens of thousands of dollars. "We have had headhunters who tell us that for years they have come to Kalamazoo to pick off talent," Kitchens said. "Now (the workers) simply won't go. They can't economically."